It’s time for the true right to make a political comeback, says the man who a few years ago became the first Republican elected governor of very liberal Maryland in 36 years. Bob Ehrlich says, in his new book “Turn This Car Around,” that there are some big issues that need to be addressed frankly and with common sense, and without political correctness getting in the way. High unemployment. Health care. Race relations. The culture wars. Ehrlich has fought those battles, first as a member of Congress then as a governor, and now provides his suggestions to help resolve those and other issues in America. Annapolis, Maryland is a small city, best known, perhaps, as the home of the United States Naval Academy. But its role in American history is large, indeed larger than many people realize. Annapolis was over a century old by the time of the American Revolution. It was, briefly, the capital of the United States, and it’s where a bold move by George Washington one December day set America on the course it has followed ever since. 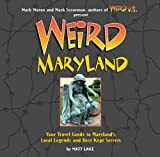 It began a few years ago with a book called “Weird New Jersey.” It became such a hit, its creators began branching out, and looking for stories of the strange, the unusual, and, well, the weird in other states.